Uh-oh. The Queen is in one of her "moods" again. I wonder if it's because the whole realm is going to hell in a handbasket. Yeah... that might be the case. The price of magic is outrageous. The army is in shambles. There's strange cults popping up all over. There's people that are responsible for taking care of all this. Why aren't they doing their jobs!?! Wait... you mean I'm the one in charge of all of this. Oh no. You're in charge of all of this! And that's just the sort of thing you'll be doing in Game of Blame, a new card game that's up on Kickstarter. 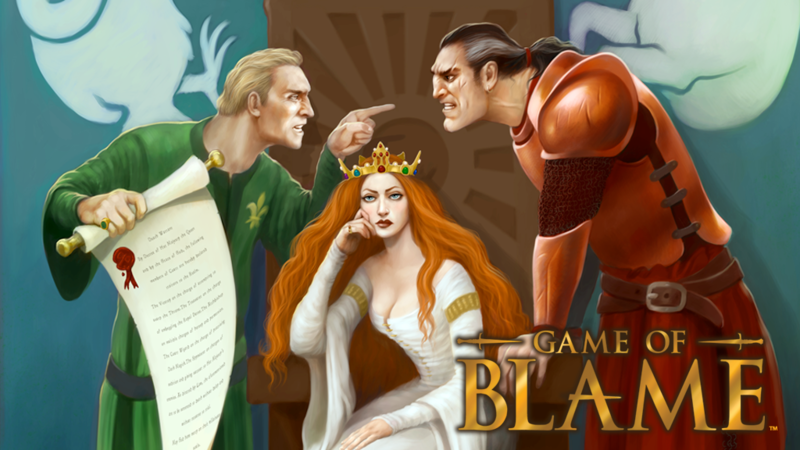 In the game, players take on the role of various officials in the royal court. Thing is, things are going wrong and so someone's going to be blamed for all of it. Your job is to get rid of as many of your Issue cards as possible, putting the blame for the country's ills on other people. Do your best to shift blame on others while avoiding getting branded a Traitor. The player with the lowest score of Issues they have to deal with and Traitor cards is the winner. The Kickstarter campaign is up and running now. They're about halfway to their goal with still 29 days left to go.